I’m pretty much obsessed with Banza pasta. It’s made out of chickpeas so naturally, I love it! These are some of my favorite ways to use Banza pasta. Most of the recipes are really easy to make but so delicious. I loved this pasta! Especially because I’m on a major sun dried tomato kick right now. It’s cooked in red wine and ghee which give it an amazing, rich flavor. The parmesan on top was like icing on the cake. I tried this one with a big glass of red wine and I was in heaven. 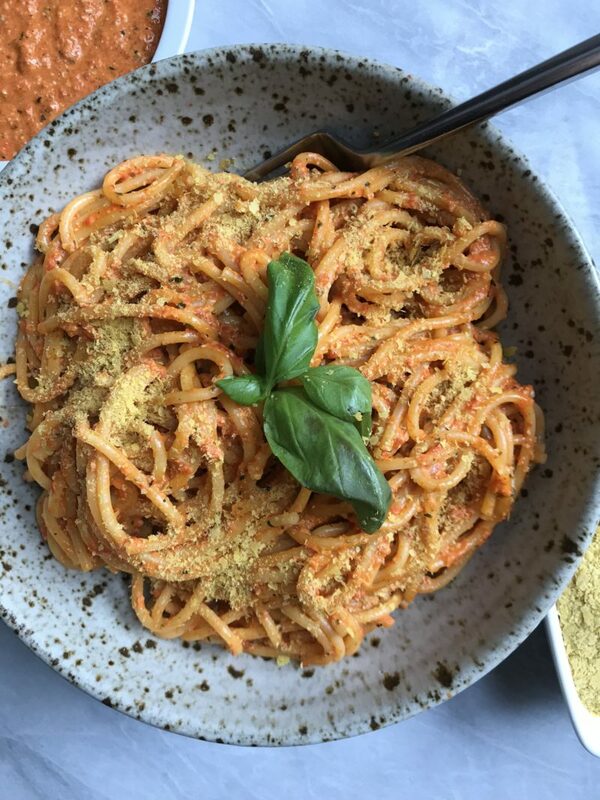 This Creamy Sun Dried Tomato Pasta Sauce will literally rock your world. Its insanely creamy and the fresh basil and sun dried tomatoes combination is to die for. Also, the nutritional yeast gives it that amazing cheesy flavor. Sometimes, I make this sauce using goat cheese or parmesan instead of the nutritional yeast. It just depends on what your body is craving in the moment! I am always in awe of Lee’s photography. She has a way of making her dishes pop off the page. And, her posts are always so relatable. I think the title says it all, miso and pesto! Basically, you need to try this combo ASAP. This sauce in so full of flavor and the fresh basil just brings it to life. The fresh garlic in the recipe was also a game changer for me! I also love how Jane talks about what you can use nutritional yeast for and why you should try it. I loved everything about this recipe. It was cheesy and saucy but also loaded with veggies. The sauce has mustard, carrots, and turmeric. So, pretty much any yellow/orange ingredients you can find! haha SO good. This pasta was sooo comforting. There is nothing like a creamy pasta on a cozy night with a glass of wine. And this one totally hit the spot. It’s super creamy and so tasty. I absolutely love fresh herbs and this pasta has both sage and basil. Hello flavor! Pretty sure all you need to do is look at this photo and you will start drooling. It’s SO SAUCY and CHEESY. And, I love that the peas bring me back to when I was a kid and would have peas in my mac and cheese. If you want to learn more, check out our free resource library with eCookbooks, intuitive eating guides and more!